When Apple claimed that the best and brightest feature of its new music streaming service was going to be a radio station, it was easy to be dismissive. 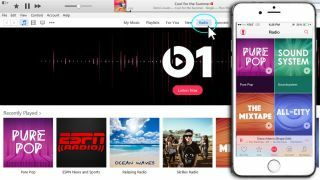 But, since launching, Apple Music has proven us wrong and has fulfilled its promise by making Beats 1 radio one of the service's best features. What's interesting, however, is that Beats 1 might soon have a few siblings, Beats 2 through 5, if Apple confirms a new report from The Verge. According to sources familiar with the situation, Apple has cleverly tucked legal copy into the documents it signed with the major music labels that allow it to create up to five additional stations without needing to alter the terms of the agreement. Apple could theoretically use the license to create a truly around-the-clock service if it decides to open studios in Asia or Australia to compliment its Los Angeles, New York and London stations or branch off into different directions. The other stations wouldn't necessarily have to follow Beats 1's example as a source for new music (like, for example, Beats 1 debuting Dr. Dre's Compton soundtrack on Thursday at 6 pm PST) and could be used for specific genres or events like live concerts, talk shows or - in a worst case scenario - holiday music. It's all just hearsay at the moment, but could lead to some potentially gripping content down the road.